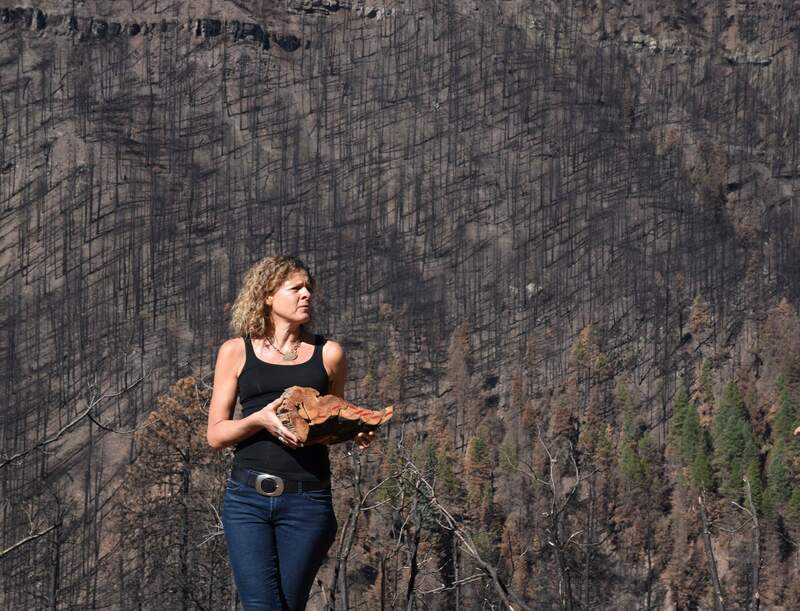 Fort Lewis College environmental biology professor Julie Korb holds a cut of ponderosa pine, which grew from 1713 to 1818 and shows fire damage. She was participating in a tour Friday in the Hermosa area of the 416 Fire burn area. Korb, who is also a forest and fire ecologist, is working on a project this year about the Missionary Ridge Fire. 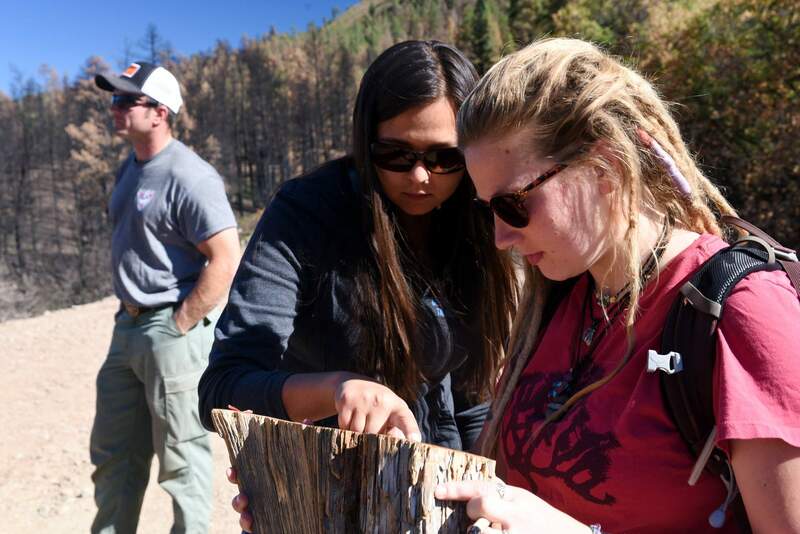 Fort Lewis College environmental studies students Abby Borge, left, of Talkeetna, Alaska, and Sara Squirrel of Montrose look at a piece of trunk from a ponderosa pine that shows fire damage that took place from 1713 to 1818. The two seniors were part of a tour of the areas burned in the Missionary Ridge and 416 fires. 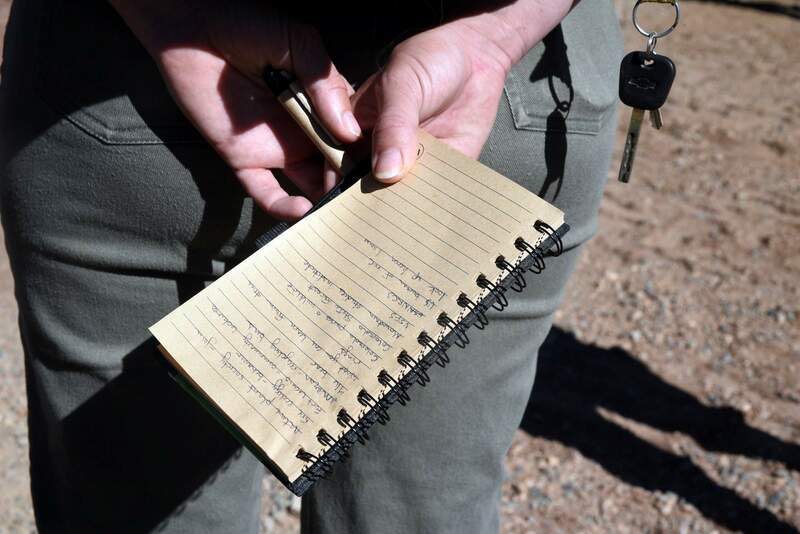 Anna Taugher, a botanist from Mancos, takes notes during a tour of the 416 Fire burn area Friday in the Hermosa area. Burn scars from the 416 Fire can be seen Friday from Missionary Ridge. 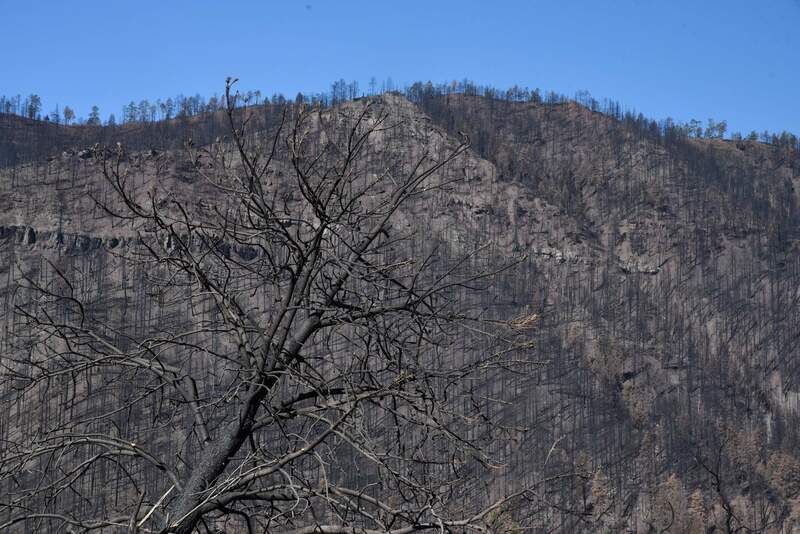 Forest managers say regrowth of areas damaged by the fire will be similar to what has occurred during the past 16 years on the Missionary Ridge Fire burn area. New tree growth is taking place on Missionary Ridge, which was burned by fire in 2002. The area is an example of what may happen throughout the 416 Fire burn area. Trees burned during the 2002 Missionary Ridge Fire intermingle with new growth. 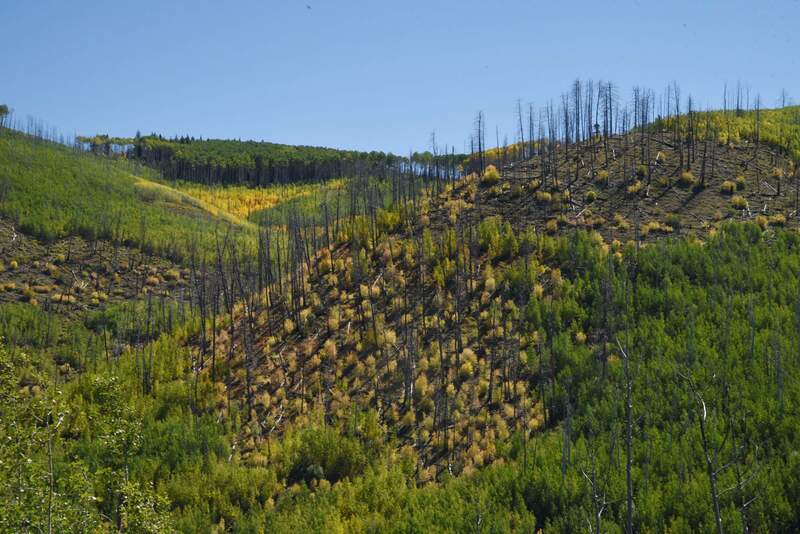 Forest managers say the Missionary Ridge Fire burn area provides a glimpse at what regrowth may look like on the 416 Fire, which burned 54,000 acres this summer on the west side of the Animas Valley. 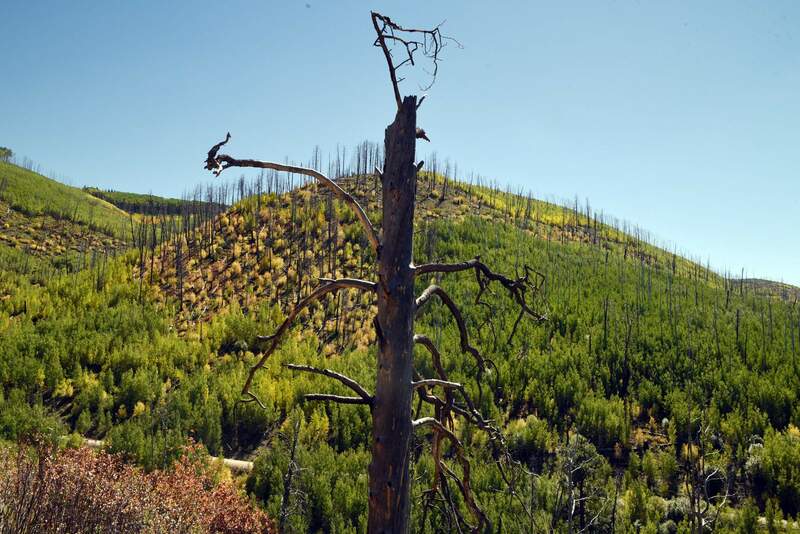 The Missionary Ridge Fire burned nearly 72,000 acres of forest land, but after 16 years, a new forest is taking root. The 416 Fire burned a mosaic of all different fire intensities. Some areas had 100 percent tree mortality, while other spots did not burn at all. 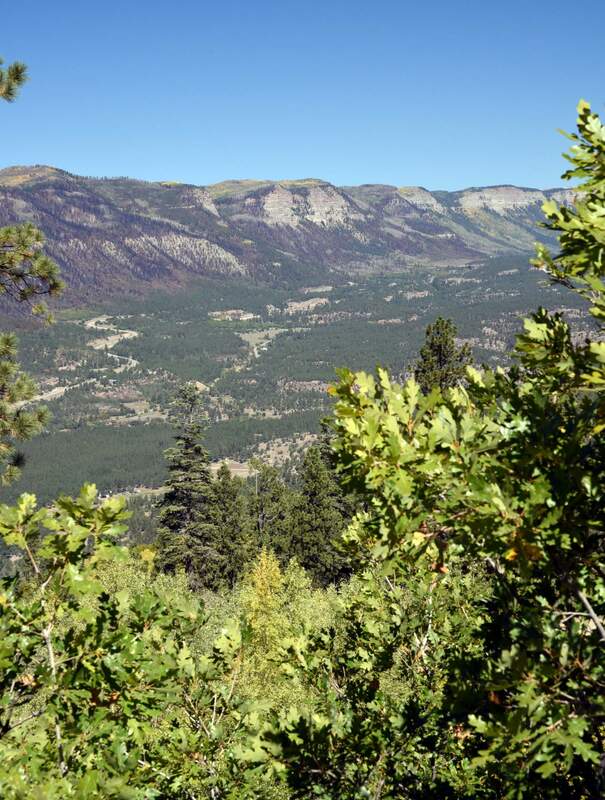 HERMOSA – Those who wonder what the Hermosa Creek drainage will look like 15 years after the 416 Fire can look across the Animas Valley to Missionary Ridge for an example of a forest recovering from wildfire. On Friday, a group of forest managers took about 25 people on a tour of Hermosa Creek, freshly burned this summer in the 416 Fire, and then as a juxtaposition, Missionary Ridge, the site of a massive wildfire in 2002. The two fires – about 10 miles apart – show many similarities, forest managers said. The 416 Fire broke out June 1 during a record drought. In a month’s time, the burn became Colorado’s sixth largest wildfire, consuming an estimated 54,000 acres of mostly San Juan National Forest land. The Missionary Ridge Fire started June 9, 2002, also in a record drought year for Southwest Colorado. The fire is Colorado’s fifth largest, burning nearly 72,000 acres, also mostly in the San Juan National Forest. 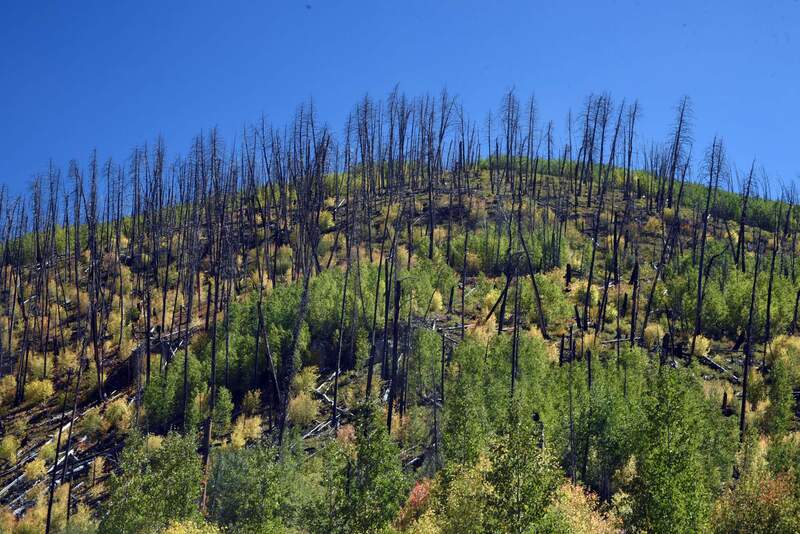 Gretchen Fitzgerald, a forester for the U.S. Forest Service, said almost immediately after the Missionary Ridge Fire went out, vegetation such as perennial grasses and Gambel oak started to repopulate. In recent years, aspen stands and some pine tree growth are starting to pop up on the landscape. Since 2013, replanting projects have been happening on Missionary Ridge with varying degrees of success. But even 16 years later, vegetation on Missionary Ridge is still changing because of the fire. Fitzgerald said foresters have noted there are still trees dying as a result of the flames from 2002. “We’re really in this for the long haul,” Fitzgerald said. A main point of interest on Friday’s tour was areas that burned at a high-intensity. Fires have always been a natural and necessary part of the landscape in Southwest Colorado, said Julie Korb, a biology professor and a forest and fire ecologist at Fort Lewis College. The fires that trees in Southwest Colorado evolved to live with, however, burn at a low-intensity, about every 10 to 15 years, she said. But because of 100 years of fire suppression, and increasing drought and temperatures related to climate change, fires in the West now see more areas of high-intensity burns, where vegetation has a difficult time regenerating. More than 30 percent of the Missionary Ridge Fire burned at a high-intensity level. Fitzgerald said a survey to be released in coming weeks will better show how many acres burned at high intensity in the 416 Fire. “These high-severity burns are unnatural fires for these types of ecosystems,” she said. Still, the forest finds a way to regenerate. On Missionary Ridge, grasses, Gambel oak and even some aspen are starting to take hold. Korb said it is a landscape that will look similar to Hermosa once that valley starts to recover. Korb said the 416 Fire appears to have burned in a sort of patchwork mosaic of all different severities. Some areas had 100 percent tree mortality, other spots didn’t burn at all, she said. About two-thirds of Hermosa Creek Drainage burned, but already, some Gambel oak and smaller vegetation are sprouting, Fitzgerald said. It is likely that deer and elk will soon return to Hermosa Creek for the renewed vegetation. Cole said her main takeaway from Friday’s tour was that it is “nice to see there’s going to be life after the fire.” But it is going to take time and patience, she said. Linda Philp moved to Durango about two years ago from Southern California. Philp was evacuated from her home in Hermosa during the fire. She joined the tour to learn more about what comes next after wildfire.